Using Maryland’s terribly flawed Public Information Act, I have been trying to get individual level compensation data from AACPS since 2008. The information I have requested is public under Maryland law, but the law has many loopholes that has allowed AACPS not to provide all the requested information. The games AACPS has played to prevent public access to this information have displayed great creativity and have evolved over time. During the most recent cycle the strategy has been to pretend that AACPS has been complying with my requests while not in fact doing so. This is a very effective political strategy. AACPS knows that very few people, and certainly not the general public or most of the local press, would bother to investigate the details. And those who do understand how the game is played, such as our local politicians (and perhaps some of the local press, too), are merely looking for an excuse to sweep this politically dangerous issue under the rug. How else to explain, for example, that so many of our Board of Education members, county councilors, and state reps appear clueless about rudimentary statistics on AACPS staff compensation. AACPS’s strategy of appearing to respond in good faith to my Maryland Public Information Act requests while not in fact doing so is thus an effective political strategy. In my opinion, the AACPS PR office’s political skill in subverting the spirit of Maryland’s Public Information Act while preserving plausible deniability helps explain why Superintendent George Arlotto thinks it’s worth paying PR chief Bob Mosier $200,000 plus dollars in annual compensation (this figure includes deferred compensation). But assuming there is a valid democratic reason why disaggregated government employee compensation is legally public information, that money and talent devoted to PR is harming the public. What follows below is a series of Public Information Act requests relating to 1) my requests for AACPS compensation data, and 2) my subsequent requests for communications (including emails and calendar entries for face-to-face communications) regarding the fulfillment of those AACPS compensation data requests. The correspondence is listed in reverse chronological order. In your November 21, 2016 email to me, thank you for clarifying that I have no more options for administrative relief from AACPS for my September 15, 2016 Public Information Act request. I did not request written guidance to all 10,000+ AACPS staff. I requested written guidance to any AACPS staff. You only confirmed that AACPS’s Office of Legal Services provided no written guidance to all AACPS staff, including employees who wouldn’t even have email and calendar accounts. Such weasel wording leaves open the possibility that AACPS’s legal counsel provided individual guidance to senior AACPS staff, including political operatives such as Assistant Superintendent Sarah (“Sally”) Pelham. I disagree with your interpretation of the clause that all employees are “to conduct themselves in a professional manner at all times.” In the context in which you use it, “professional” would have the exact opposite meaning; that is, if an employee was careful not to get caught—a trivial proviso given that AACPS has no enforcement mechanism, let alone one designed to be effective. 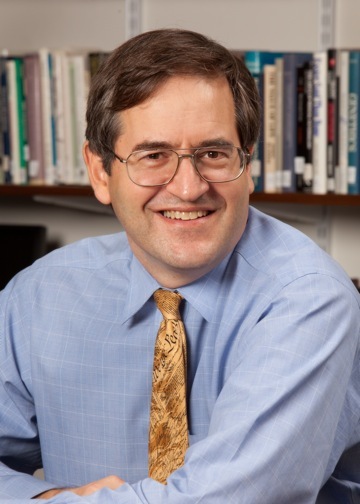 Moreover, even if your claimed interpretation of professionalism was the meaning genuinely intended, the American system of government is not based on the premise that pious declarations of fealty to the public good, including vague protestations of “professionalism,” are an adequate substitute for credible enforcement mechanisms. For example, AACPS has many rules that it doesn’t choose to enforce when it would be inconvenient for it to do so. Indeed, few things make senior AACPS staff more furious than being forced to enforce one of AACPS’s rules that they have long ignored. It is inconsistent with the spirt of the Public Information Act to put words in a requester’s mouth and then respond to the made-up request. My interest is in how AACPS staff respond when a requester seeks highly controversial information that AACPS seeks to keep confidential because it is viewed as politically embarrassing information. As you know, that covers a miniscule portion of the information the public seeks from your PR office. Most parents are far too intimidated to seek highly controversial information from your office. You state that my “request is the first I can recall involving calendar entries.” But over a series of many months I unsuccessfully sought certain emails and calendar entries from Assistant Superintendent Sarah Pelham. Those emails and calendar entries involved political activities on behalf of AACPS staff that she had a strong incentive to hide from the public and that would have been highly embarrassing to AACPS if publicly exposed. I then wrote about issues related to those missing emails and calendar entries in numerous documents seen by you, the superintendent, and the Board of Education (e.g., see Hogan upholds rigged election system, Capital, July 11, 2016; AACPS THUMBS ITS NOSE ON MARYLAND’S VAGUE AND MEANINGLESS BAN ON USING GOVERNMENT RESOURCES FOR POLITICAL ACTIVITY, eLighthouse, April 23, 2015; and THE SMOB ELECTION AND RIVA ROAD’S CULTURE OF INTIMIDATION, October 5, 2016). Evidence of AACPS’s political self-interest in this matter is that neither the superintendent, Board of Education, nor AACPS Ethics Panel investigated Assistant Superintendent Pelham’s misuse of government resources for political purposes. Any such meaningful investigation would have had to include whether, to use your term, she “unprofessionally” deleted potentially embarrassing emails and calendar items. Clearly, not only have people requested calendar entries, but AACPS has done nothing to ensure that it “professionally” implements either your claimed spirit or letter of the Public Information Act regarding such matters. At this point, I will assume that I have no more options for administrative relief from AACPS for my October 21, 2016 Public Information Act request. You did not respond to my October 21, 2016 Public Information Act request within the 30 days mandated by law. But, as you know, no one takes that part of the Public Information Act seriously (even if the letter-of-the-law is almost always followed), and no one is more skilled at exploiting the loopholes in that provision (and other provisions of the Public Information Act) than you. A definition of chutzpah: 1) blatantly ignore the obvious contents of a Public Information Act request, 2) pretend that fulfilling it would be a new Public Information Act request, and 3) charge the requester in response to the second Public Information Act request for all the effort caused by not fulfilling the first Public Information Act request. Printing out the detailed/meeting rather than the one-day calendar view of a meeting should have been the obvious response to my Public Information Act request. Asking for this obvious error to be fixed should not be viewed as a new Public Information Act request; it should be view as fixing an obvious error from a previous Public Information Act request now long, long overdue. Please understand that in my new Public Information Act request I am not requesting the written guidance provided to IT staff about how they should do backups. (As an aside, we have already established that 1) such documents don’t exist in writing, or 2) if they do exist in writing, cannot be provided to me.) What I haven’t asked for before and you certainly haven’t provided me is what guidance is provided to AACPS staff about what type of email and calendar entries they must keep, especially in response to a Public Information Act request. Given that you are AACPS’s chief information officer, I will be satisfied with such written guidance 1) provided to you, and 2) that you have provided to others. If you don’t have such guidance and so cannot provide it to others, even if you are merely passing along advice from AACPS’s legal counsel, then we are dealing with a type of secret law that is so secret that it is irrelevant (for secret law to be effective, it must be known to the key decision makers that rely on it). I trust that you will respond to my most recent Public Information Act request in good faith rather than send me information I didn’t request while both pretending that it is the information I did request and ignoring the actual contents of my request. While I realize your request is not limited to email communications. I must reiterate – as you know through being informed in response to the many previous requests you have submitted regarding AACPS communications – our operational standard for e-mail retention is currently 30 days. Mailboxes for individual users are backed up to tape media each night. The tape rotation covers a 30-day period. Individual mailboxes can be restored from tape backup for that time period only. A restored mailbox would contain any information in that mailbox (Inbox, Outbox, Sent Items, Deleted Items, etc.) on the date that the tape was created, even if those documents were created or modified outside the 30-day window. As you are also aware, § 4-206 (b) allows a custodian to “charge a reasonable fee for search for, preparation of, and reproduction of a public record.” Under the provisions of the Act, the first two hours of labor would be provided free of charge. You would be responsible for reimbursing AACPS for the labor required to complete all other research and compilation of documents. AACPS is currently discussing whether this request, given that it is essentially the latest part of what is ongoing request, would require reimbursement from you given the fact that more than two hours has already been expended on researching and compiling documents related to the previous portions of this request. The meeting Florence Bozzella had with Kathy Orndorff. 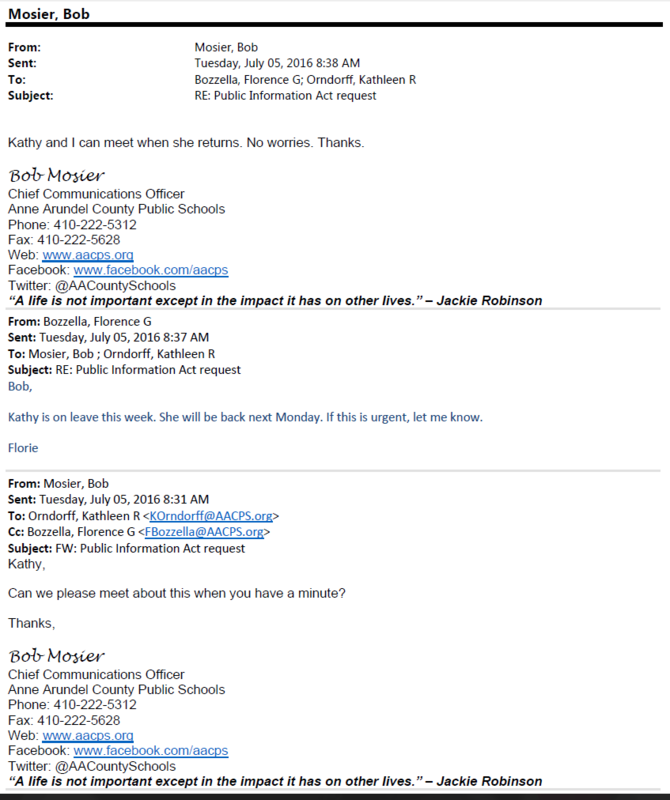 The meeting with Michelle Cattaneo (I’m assuming that AACPS attorneys keep a log of meetings providing legal advice provided to AACPS staff). You and other AACPS staff apparently don’t keep written notes of meetings, including those with Superintendent George Arlotto, concerning the fulfillment of politically sensitive Public Information Act requests. Please note that if such written records exist, they would be covered under my Public Information Act request. Blacked out parts (presumably meetings on other subjects). Fields that were not blacked out but only partially disclosed. For example, the names of meeting participants and the description of the meeting were not disclosed. Calendar entries for only a subset of the meeting participants, Bob Mosier and Kathy Orndoroff. Remarkably, you provided me the day, not the meeting, view of the records. All calendar systems that I know of have both a day and item view. The problem with 2) above could easily have been solved if you provided me with the item (“meeting’) view. Perhaps I am wrong, but I am not aware of any law that allows you to either black out calendar entries, 1) above, or print them out in such a way that the contents of responsive fields are only partially disclosed. With Hillary Clinton’s email practices on the front pages of newspapers all over the country, I hope that you and your colleagues at AAPS recognize that some of AACPS’s traditional email practices should be discontinued. Under the Maryland Public Information Act, State Government Article (SG) §§ 10-611, et seq., I request that you provide me with the following: from January 1, 2011 to when this Public Information Act request is fulfilled, any written guidance to AACPS staff, including from AACPS’s legal counsel, concerning the “removal” of any email or calendar entries from the files that are backed up on AACPS’s central server. Removal is defined as deleting, printing out, transferring to a private account, or avoiding making official email and calendar records available to the central server for backup in the first place. If this response is not fulfilled within the 30 days required by law, I will assume that AACPS has no such guidance regarding the removal of official email and calendar records, including in response to Public Information Act requests for official email and calendar entries. This communication is in response to the follow-up email to your request under the Public Information Act, Annotated Code of Maryland, General Provisions Article (GP) § 4-101, et seq., seeking information related to certain Anne Arundel County Public communications. Attached please find two calendar entries responsive to your latest request. The first page in the document is my calendar, and the second is that of Kathleen Orndorff. Please acknowledge that you read my Public Information Act request and responded (see Oct. 10, 2016 email below) with all “written communication,” as I requested (see Sept. 15, 2016 email below), not just written email communications, as I’ve requested in the past. I requested all “written communications” because I considered it likely that you and your colleagues who control access to AACPS compensation data would try to avoid, delete, transfer to private email, or print out on paper email communications about a highly sensitive matter subject to a Public Information Act request. For example, it seems implausible to me that the three extraordinarily busy AACPS officials, including you, who met face-to-face to discuss what compensation data not to include in your Public Information Act response to me, wouldn’t schedule the meetings in your calendars. 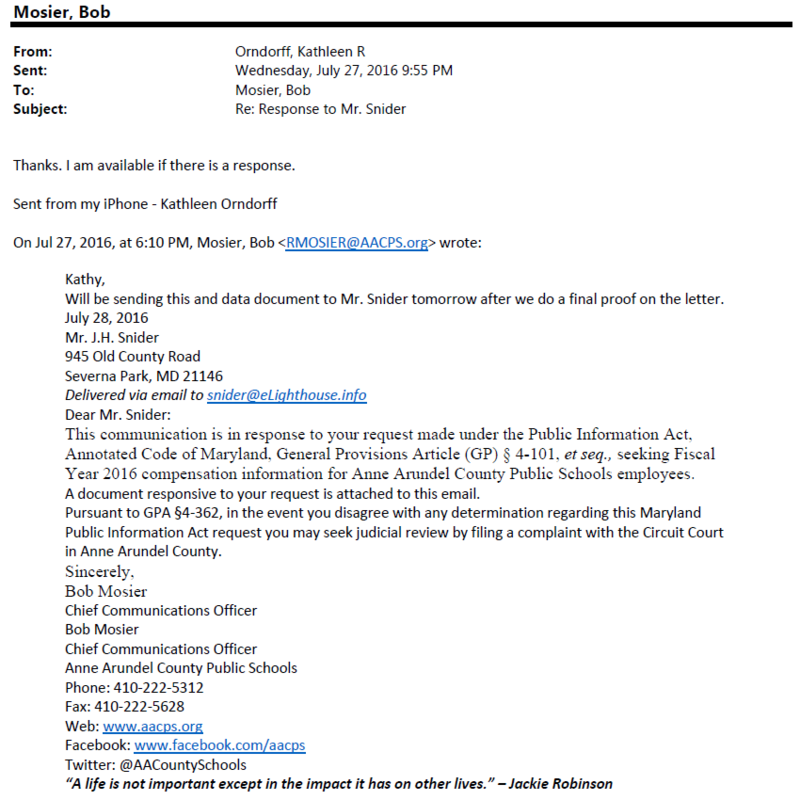 Those calendar entries are public records and would constitute “written communications concerning my Maryland Public Information Act requests for AACPS compensation data” and should have been included in your response. Assuming they exist, other types of written communications that should have been included would be emails printed out to avoid compliance with requests for those communications in email format (this has been standard practice in Anne Arundel County government for potentially controversial public records), and communications transferred to private archival systems so that they are not accessible via a Public Information Act request. Of course, truly deleted responsive documents would not be subject to my Public Information Act request. I trust that if you have inadvertently omitted any of the above documents, including relevant meetings with Superintendent George Arlotto, that you will provide them in accordance with Maryland’s Public Information Act. Please be advised that no matter how politically sensitive you and your colleagues consider not only disaggregated AACPS compensation data but also communications about strategies to restrict public access to it, your first obligation should be to comply with the law. The responsive documents are copied below. At lease six AACPS staff members were involved in processing this response: Mob Mosier (chief PR officer), Florenc Bozella (head of Human Resources), Michelle Cattaneo (AACPS legal counsel), Kathleen Orndorff (IT), Sandra M. Grzesik (IT), Maureen W. Beaupre (IT). It is also likely that others, such as Superintendent George Arlotto, were informed of this matter in Mosier’s frequent face-to-face meetings with the superintendent. 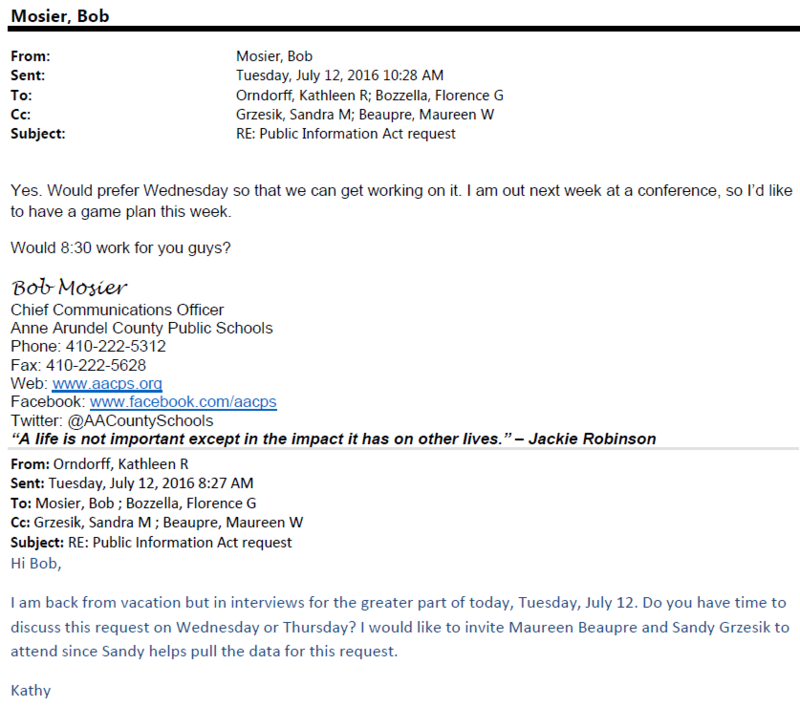 The correspondence refers to two face-to-face meetings to fulfill my Public Information Act request: Florence Bozzella with her IT staff, and Bob Mosier with the IT staff. It also alludes to a possible third meeting/discussion with Michelle Cattaneo, AACPS legal counsel. Staff interactions with counsel have in the past been considered privileged information; counsel also tends to be very careful not to put any advice in writing, so it is likely that there was a face-to-face meeting not disclosed here. This communication is in response to your request under the Public Information Act, Annotated Code of Maryland, General Provisions Article (GP) § 4-101, et seq., seeking information related to certain Anne Arundel County Public communications. This communication is in response to your request under the Public Information Act, Annotated Code of Maryland, General Provisions Article (GP) § 4-101, et seq., seeking information related to emails regarding your most recent request under the Act. While it is my practice to acknowledge receipt of requests made under the Act within 10 days, I had a family member seriously injured in an accident and therefore this communication falls outside that window. As you may be aware, § 4-206 (b) allows a custodian to “charge a reasonable fee for search for, preparation of, and reproduction of a public record.” Under the provisions of the Act, the first two hours of labor would be provided free of charge. You would be responsible for reimbursing Anne Arundel County Public Schools for the labor required to complete all other research and compilation of documents. Please note that Maryland law required AACPS to provide some type of written response to my September 15, 2016 Public Information Act request (copied below) within ten days of its submission. As of this afternoon, it is now a full two weeks since its submission. 5) AACPS continues to refuse to account for the numerous omissions, inconsistencies, delays, and errors in the compensation data it has provided to me in previous years in response to my requests for AACPS compensation data, including data types that AACPS now claims were illegally provided to me. 3) between Director of Human Resources Florence Bozzella and Senior Manager of Records Management and Quality Control Kathleen Orndoff. The written communications should be provided between June 3, 2016 (when I first made the request for FY2016 AACPS compensation data) and the date you fully comply with this Public Information Act request. Any fee you request for complying with this Public Information Act request should break down the cost by components 1), 2), and 3) described above. Thank you in advance for complying within the 30 days required by law. As Anne Arundel County Public Schools prepared the response to your most recent request, we reviewed the data we provided to you last year in response to an identical request you submitted last year. During that review, we found that you had received data that should have been withheld – specifically, data regarding individual leave that could be used to determine the amount of leave accrued or used by an employee. As has previously been stated to you, the amount of leave accrued or used by an employee is part of a personnel record and therefore not disclosable. Additionally, pay types that do not involve compensation (lost time, for example) were not provided to you. Regarding your other points, it should come as no surprise that not every category of compensation is awarded to every employee in every year. You have been provided the disclosable categories of compensation utilized by AACPS in FY2016. What specifically was the compensation data that was withheld this time that wasn’t withheld last time? The FY2016 compensation data file sent me was substantially smaller than the FY2015 file (which itself was missing requested data) despite rising student enrollment and teacher headcounts. Does some of the withheld data include pay code records? Would it be reasonable to conclude that the twenty missing pay code types were missing from the file you sent me at least partly because the records to which they were attached were also excluded? Please explain under what law each of the missing pay code types was excluded from the data you sent me. I am aware that what you consider exempt information changes from day to day and that since you do not document your exemption claims such inconsistent claims are ordinarily very hard for the public to track. To take one apparent example, I would like to remind you that the pay code for the accumulated sick leave payout is public information and was front page news when former Superintendent Robert Maxwell left AACPS. Please recall that you have still not addressed my specific questions regarding missing fields. Notably missing, for example, is the total salary field. If within ten days you do not fulfill my July 1, 2016 Public Information Act request for AACPS compensation data, I will assume I have exhausted administrative relief. I am cc’ing Ms. Bozzella because her staff in Human Resources will ultimately be responsible for either providing or not providing you with the AACPS compensation data I’ve requested through your office. Subsequent to your previous request and our response, we discovered that some data that should have been withheld because it falls under an employee’s personnel record was, in fact, not withheld. That data was withheld in response to your most recent request. The pay category codes provided to you were the ones utilized during the time period contained in your request. I am forwarding this email to you because Bob Mosier is out of his office and, in any case, would need to forward my email to your office for an authoritative response. I look forward to hearing your explanation for the apparent omissions in the data your office provided me in response to my Maryland Public Information Act request. In my Public Information Act request (originally sent on June 3, 2016 and then resent on July 1, 2016 at your request), I requested FY2016 AACPS compensation data for the following fields: Employee ID, Last Name, First Name, Middle Name, Title Code, Title Description, Unit #, Work Location, FTE, Total Salary, Pay Code, Pay Category (Pay Code Description), Pay Code Amount, Work Cycle, Grade, Step, Degree, Hire/Seniority Date, and Years Experience. Of these, salary is most important, partly because the pay categories are supposed to include both non-taxable and taxable items. In both my June and July requests for the same FY2016 compensation data, I carefully described how both the total salary and paycode data were to be included. Previously, you included records for 72 different pay codes. This time only 52 pay codes were included. Apparently missing are hugely important pay codes such as payouts for accumulated sick leave. No explanation was provided for this discrepancy. Please explain it and the apparently missing records associated with it (each pay code for an employee is associated with a record, so when a pay code is missing so is the accompanying record with data for that pay code). In the past, arguing that the information was proprietary, you have refused to provide me with the AACPS manual that staff use to learn about the payroll database’s fields and file structure. It thus became an immense task, taking many years and countless Public Information Act requests, as well as suffering harassment initiated by your office, for me to simply learn what types of payroll fields you had and which were considered public records under the Public Information Act. It now appears that all that effort to learn what fields exist and can be requested was not adequate, as compensation data may have been arbitrarily withheld without any public notice. I hope you will provide me with a better explanation for the apparent discrepancy in pay codes and corresponding records. It is now two months since I originally requested the FY2016 AACPS compensation data. In keeping with both the spirit and letter of the Public Information Act, I hope you will promptly, thoroughly, and courteously respond to my observations above about the known and possible omissions in the data you sent me. I hope that in your response you will also rectify any omissions consistent with my July 1, 2016 Public Information Act request to your office. Within the next ten days, please rectify any omissions and/or let me know that my observations about omissions have no merit. If I don’t hear back from you within the next ten days, I will assume it is your intent not to respond and that you believe you have already fully complied with the spirit and letter of the Public Information Act. This communication is in response to your request made under the Public Information Act, Annotated Code of Maryland, General Provisions Article (GP) § 4-101, et seq., seeking Fiscal Year 2016 compensation information for Anne Arundel County Public Schools employees. A document responsive to your request is attached to this email. Under the Maryland Public Information Act, State Government Article (SG) §§ 10-611, et seq., I request the FY2016 non-exempt compensation information for all AACPS employees, broken down by pay code, in Excel, a machine-readable format. This should include the following fields for FY2016 for each employee broken down by paycode: Employee ID, Last Name, First Name, Middle Name, Title Code, Title Description, Unit #, Work Location, FTE, Total Salary, Pay Code, Pay Category (Pay Code Description), Pay Code Amount, Work Cycle, Grade, Step, Degree, Hire/Seniority Date, and Years Experience. The total salary field should be included in each record and the information broken down by pay code for each employee. My estimate is that it should take no more than five minutes for an AACPS payroll staffer to fulfill this Public Information Act request. In any case, please charge me no more than the amount you have charged the Capital or individual AACPS Board of Education members for copying similar records and correcting mistakes made by AACPS. In the past, you have made it abundantly clear that AACPS doesn’t want the public to have access to the detailed compensation data that comprises more than 80% of AACPS’s operating budget and is legally public data. Most obviously and unlike many other local government units in the United States, AACPS has not proactively posted this vital public data online and has repeatedly refused to do so. In the past, when I’ve requested this data through a Public Information Act request you complained to members of the Maryland General Assembly that this information shouldn’t be public under the law. When that didn’t work, you sent my request to thousands of AACPS employees and effectively launched a harassment campaign against me. More recently, you have claimed to comply with my requests while not, in fact, doing so, including fulfilling my requests with obviously faulty data, incomplete data, and data that would needlessly require the complex integration of data among various files. Nor has your resistance to providing disaggregated compensation data been restricted to me. A former Capital reporter has told me that both you and the then superintendent called her and effectively intimidated her when she sought similar disaggregated compensation data (she reported to me that it was the investigation that got her the greatest pushback from your office during her years as a Capital education reporter). And when a school board member trying to do his due diligence requested such information (school board members acting individually have no more legal authority than a regular citizen to get this information), you initially refused to provide it to him. Ultimately, he had to ask the board attorney to get it from you. This is the nature of the “back-and-forth” (see your June 9, 2016 email to me) that has in recent years become your core strategy for avoiding compliance with such Public Information Act requests. It now appears that you to want to combine this back-and-forth strategy with the more conventional excessive fee strategy. I hope you will resist taking that path. Your fulfillment within the thirty calendar days required by the Public Information Act would be appreciated. You have asked for information encompassing the entirety of Fiscal Year 2016. As you correctly note in your email, however, this information does not yet exist since Fiscal Year 2016 does not end until June 30, 2016. Given that there is no information available to fulfill your request, your request is denied. This request is identical to previous requests you have made for this data from other fiscal years. While your email reiterates that you have been unsatisfied with the documents provided you in response to those previous requests, you should not expect that an identical request for FY2016 will result in different data than has previously been provided to you. In previous responses to you, I have made clear that Anne Arundel County Public Schools has been overly generous in expending significant time beyond that allotted as free under § 4-206 (b) of the Act to fulfill your requests. I have also made clear to you that AACPS would no longer engage in the back-and-forth type of requests and follow-ups which you regularly choose to employ, and that we would henceforth provide you with a cost estimate, as allowed under the Act, for any time beyond two hours needed to fulfill your request. You can expect such an estimate should you choose to refile this request at a later date. The Act does not require agencies to create reports to satisfy a request. I recognize that the data for FY2016 will not be complete until June 30, 2016. Please email me the data on Friday, July 1, 2016 or as soon thereafter as possible. I’m making the Public Information Act request now because in the past when I’ve requested disaggregated AACPS compensation data you’ve not actually fulfilled the request—that is, according to my written specifications—within the thirty days required by law. I’m hoping that this year will be different and that the longtime nightmare of seeking disaggregated AACPS compensation data from your office will finally come to an end and without needless hassle.